Aloevera benefits – how does it work? The most important health benefit of Aloevera plant is that it reduces the pain of a burn very fast and quickly. So, one can apply Aloevera immediately in case of any type of burn. This not only reduces the pain but also helps in healing the wound quickly. Aloevera contains various essential nutrients like minerals, vitamins and enzymes which help in strengthening the immune system. Another health benefit of Aloevera is that Aloevera juice is used in relieving digestive problems. Aloevera acts as an antibacterial agent and protects the skin of a person against the sun’s ultraviolet rays. It increases the flow of blood to the areas of wound and enhances fibroblasts. Aloevera has provided number of benefits to a person such as it helps in healing the sores and blisters and also helps people suffering from Psoriasis by reducing the itching and pain. It has shown considerable improvement in the reduction of lesions.Other health benefits of Aloevera is helpful in case of minor cuts, scrapes and bruises and provides relief to a person rapidly. The healing properties of the succulent plant Aloevera have been known for thousands of years. Belonging to the lily family and related to the onion, garlic and asparagus, evidence supporting the early use of Aloe was discovered on a Mesopotamian clay tablet dating from 2100 BC. In Cairo in 1862, George Ebers, a German Egyptologist, bought a papyrus which had been found in a sarcophagus excavated near Thebes a few years earlier. 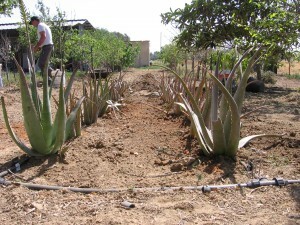 Aloevera as a herbal preparation, was mentioned in the papyrus no fewer than 12 times. Aloevera was well known not only to the Egyptians, but also the Roman, Greek, Arab and Indian cultures. In fact, many famous physicians of those times, including Dioscorides, Pliny the EIder and Galen – considered to be the father of modem medicine – included Aloevera in their therapeutic armories. Myths and legends surrounding the use of Aloevera in ancient times suggest that it was an important part of the beauty regime of the Egyptian queens, Nefertiti and Cleopatra. Legend has it that, in 333 BC, Alexander the Great was persuaded by his mentor Aristotle to capture the island of Socotra in the Indian Ocean, famed for its supply of Aloe which he needed to heal his wounded soldiers. Aloevera has been used by people to compliment their current regime of medication and supplements with the advice and approval of their doctor: Acid Reflux Disease Acne Acne Scars Arthritis Asthma Bleeding Gums Boils Bowel Disorder Brown Skin Spots Burns Chronic Fatigue Syndrome (CFS) Constipation Crohns Disease Cuts and Wounds Dermatitis Diabetes Diverticulum Dry Skin Eczema Fibromyalgia Genital Herpes Gout Hair Loss Hay fever Hemorrhoids Hypertension Interstitial Cystitis Irritable Bowel Syndrome Joint Pain Kidney Stones Liver Spots Migraine Milia Nappy Rash Psoriasis Rheumatism Scalds Scars Sinus Problems Spastic Colon Stretch Marks Sunburn Tendinitis Ulcerative Colitis Ulcers of the Mouth Ulcers of the Skin Ulcers of the Stomach Varicose Veins. Some recent studies appear to show topical and orally administered Aloevera preparations in patients with chronic venous leg ulcers may aid healing. The Aloevera plant, with an average pH of 4.5. The remaining solid material contains over 75 different ingredients including vitamins, minerals, enzymes, sugars, anthraquinones or phenolic compounds, lignin, saponins, sterols, amino acids and salicylic acid. These are described in more detail below. The plant contains many vitamins, excluding vitamin D but including the important antioxidant vitamins A, C and F. Vitamins B (thiamine), niacin, vitamin B2 (riboflavin), choline and folic acid are also present. Some authorities suggest that there is also a trace of vitamin B12 (Coats1979). When taken orally, several of these biochemical catalysts, such as amylase and lipase, can aid digestion by breaking down fats and sugars. One important enzyme, a carboxy-peptidase, inactivates bradykinins and produces an anti-inflammatory effect. During the inflamma-tory process, bradykinin produces pain associated with vasodilation and, therefore, its hydrolysis reduces these two components and produces an analgesiceffect (Obata et al 1993, Shelton 1991). Minerals Sodium, potassium, calcium, magnesium, manganese, copper, zinc, chromium and iron are all found in the Aloe plant. Magnesium lactate inhibits histidine decarboxylase and prevents the formation of histamine from the amino acid, histadine (Shelton 1991). Histamine is released in many allergic reactions and causes intense itching and pain. The prevention of its formation may explain the antipuritic effect of Aloevera. Sugars – Sugars are derived from the mucilage layer of the plant under the rind, surrounding the inner parenchyma or gel. They form 25 per cent of the solid fraction and comprise both mono- and polysaccharides. By far the most important are the long chain polysaccharides, comprising glucose and mannose, known as the gluco-mannans (Beta – (1, 4) – linked acetylated mannan). When taken orally, some of these bind to receptor sites that line the gut and form a barrier, possibly helping to prevent ‘leaky gut syndrome’. Others are ingested whole by a method of cellular absorption known as pinocytosis. Unlike other sugars which are broken down prior to absorption, the polysaccharides are absorbed complete and appear in the blood stream unchanged. Here, they act as immuno-modulators — capable of enhancing and retarding the immune response (Green1996, Kahlon etal 1991, Sheets etall9gi). Saponins – These soapy substances form 3 per cent of the gel and are general cleansers, having antiseptic properties (Hirat and Suga 1983). Plant Sterols – These include Campesterol, f3 Sitosterol and Lupeol (Coats 1979). Sallcylic acid – This is an aspirin-like compound possessing anti-inflammatory and antibacterial properties. Topically, it has akerolytic effect which helps to debride a wound of necrotic tissue. Amino acids – These are the building blocks of proteins. Aloevera provides 20 of the 22 necessary amino acids required by the human body and seven of the eight essential amino acids which the body cannot synthesise. These must be ingested in food. It is surprising that the evident healing effects of Aloevera can be produced by such a small quantity of solid material. Some people believe that there is a synergistic action between all the component ingredients, giving a result which is greater than the sum of the individual actions. The combined action of all herbal preparations taken from whole stems, roots, leaves or fruits containing huge numbers, but very small amounts of phyto-chemicals, stretches the boundaries of the conventional medicinal paradigm. In all allopathic (orthodox) medicine, the practice is to isolate, in a chemically pure form, the biologically active substance of the constituent ingredients. These extracted drugs must be uniform in their composition in order to demonstrate a consistent physiological effect. Perhaps there is some truth in an ancient Ayurvedic text from India: ‘Extracting drugs from a part of the plant is taking out the intelligence and throwing away the wisdom.’ Whole plant preparations; though less potent, are generally considered to be safer with fewer side effects. 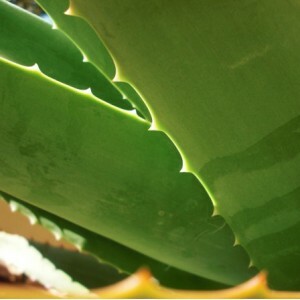 The evidence suggests that the primary sites of action for Aloevera are: Epithelial tissues — the epithelium is the layer of cells which covers the surface of the body or lines a cavity that communicates with the surface. The skin, the largest organ of the body, is also the largest epithelial surface — but other epithelial tissues line the nose, sinuses, lungs, mouth, esophagus and alimentary tract, as well as the genital tract. This action on surfaces and membranes, rather than sol-id organs, may account for some of the healing properties of Aloevera (Davis et al 1987, Fulton 1990, Heggers 1996). The immune system — here, Aloevera exerts an effect on the cytokine system, resulting in immunomodulation (Green 1996, Marshall et al 1993, Winters 1993). In the US, the polymannose sugar has been extracted by Carrington Laborat-ories and its product, Carrisyn, has been licensed to treat the onchogenic retroviral infection which causes Ieukaemia in animals. Aloevera appears to speed up the healing of damaged epithelial tissue in bums and leg ulcers by: Providing essential micronutrients An anti-inflammatory effect. An antimicrobial effect The stimulation of skin fibroblasts (Danhoff and McAnally 1983). Aloevera can be taken internally. The principle ingredient of any product should be the stabilised Aloevera gel which is as near to the inner gel of the natural plant as possible. It must not, therefore, be treated with excessive heat or filtered during the manufacturing process, as this destroys or reduces the effect of certain essential compounds, such as the enzymes and polysaccharides. Regrettably there are many products which contain virtually no Aloe and yet are marketed as though they do. Caution applies particularly to cheap capsules of dried aloe leaf. Not only does Aloevera provide nutrition and pro-duce an anti-inflammatory action, it also has a wide range of antimicrobial activity. In-vitro experiments have been carried out on numerous organisms and have regularly shown that, in normal strength, Aloevera is either bactericidal or bacteriostatic against a number of common wound pathogens.